For the cover of this second edition of He Remembers the Barren, we commissioned an original work of art from artist Edward Riojas. Together with author Katie Schuermann, we gathered together our ideas and expressed our Christological vision to the artist, knowing that he would bring more than we could even ask into this beautiful painting. Pictured here is a barren tree at the peak of springtime, showing the contrast between that which is full of life and that which bears no life, a tree that is stuck in winter even in spring. The tree appears healthy with no obvious scars, except for its womb-like cavity that grieves with emptiness. Yet a cruciform shoot sprouts from the trunk, symbolizing the Life—namely, Christ—that would spring from the stump of Jesse (Isaiah 11:1). It is life and hope springing out of what is dead, and the shadow that the shoot casts on the larger tree signifies its identity in Christ. There is also an unexpected function of the tree: while the tree bears no fruit of its own, it bears fruit in other ways, offering itself as a resting place for a nest, for a mother bird feeding her hatchlings. This is but one example of the other vocational gifts that God gives to the barren, an opportunity to serve her neighbor by supporting other mothers and children, for those of us in the family of Christ are joined by the waters of Holy Baptism, not just by the branches in our family tree or the blood in our veins. First published in 2011, He Remembers the Barren is a tender conversation with women in the church who wrestle with the issue of barrenness in marriage. Schuermann offers encouragement and support to those struggling with infertility, gently addressing issues such as control of our bodies, family planning, IVF, adoption, and the source of conception, all while reminding the reader of her clear vocation in Christ and pointing her to the ultimate source of fruitfulness, vitality, and comfort: our Triune God. 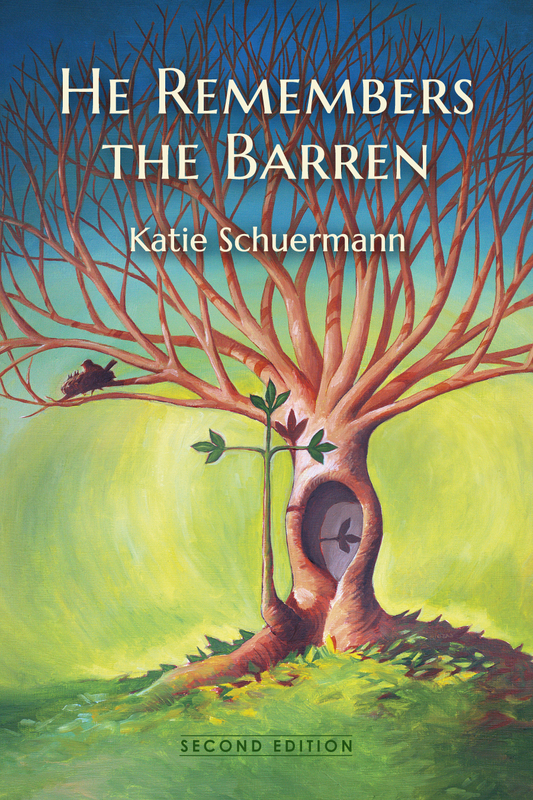 This book is not only for barren women but also for anyone seeking insight into suffering and hope; Schuermann focuses on our identity in Christ, told through the lens of barrenness. Read more about the content of the second edition here. We anticipate it being available at the end of May. More details to come! To learn more about Edward Riojas, read our book cover artist announcement from March. Special thanks to our graphic designer Meghan Schultz, who collaborated with Janet Frese to design the cover.